This medley is a tribute to drumming legend John "Bonzo" Bonham and was written to feature the drumset player in a percussion-ensemble setting. Bonham's grooves, fills, and solos are accurately transcribed to provide the performer with the signature sound of Led Zeppelin. 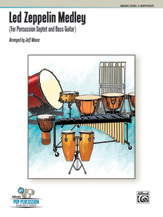 The ensemble parts have been arranged to capture the essence of these iconic songs and to provide the drummer with a realistic setting to perform these classic drum parts. If you are looking for a piece to showcase an outstanding drumset performer, you have found it!